For spiking, aerating and overseeding. 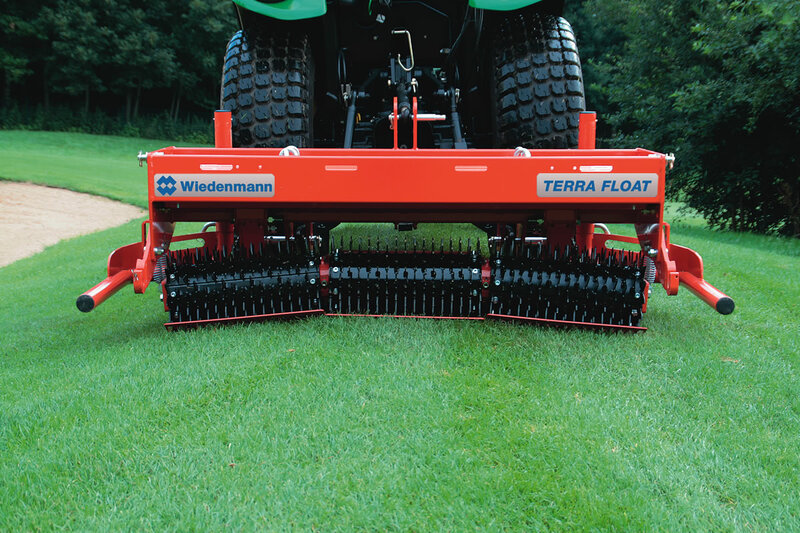 The TERRA FLOAT is equipped with a 3 part suspended tool roller that may be optionally fitted with spike or star shaped tools. The roller's swivel suspension means the spike and star shaped tool sections easily adjust to undulating terrain. Intensive contact between seed and soil is necessary for successful germination. Equally important is even, stripe free spreading of seed. Optional equipment: Full tines, star segment, drop type overseeding unit, spring tines for overseeding unit, follow-up roller, ballast weights, rear roller, mounting parts for overseeder, hydraulic weight transfer system, trailing brush and roller set. If you are interested in our TERRA FLOAT use the quick enquiry form below.